Follow I-81 south to US Rt. 6 east, just outside of Scranton, PA. Follow US Rt. 6 east right into Honesdale. Turn right onto Main Street by the Hotel Wayne. Follow I-88 west to Exit 9 in Sidney, NY. Turn left off the ramp onto NY Rt. 8 south and follow that road to Deposit, NY. At the end of Rt. 8 turn left onto Rt.17 east toward New York City. Go about 11 miles and take the Hancock, NY exit. Turn left off the ramp, then turn right just before the NAPA Auto Parts store. Follow that road around to the left and make the next right turn across the railroad tracks. After crossing the tracks, keep going straight and cross the bridge into Wayne County, Pennsylvania. Once you cross into Pennsylvania the road you’re on becomes PA Rt. 191 south. Follow PA Rt. 191 right into Honesdale. Continue straight onto Main Street. Turn left onto 9th Street, and then another left onto Church Street. Central Park will be to your right. Make your way to US RT 6 west toward Honesdale. A short distance after you pass Dave’s Super Duper, turn right after you cross the bridge, following the signs toward US Rt. 6 west and Rt. 191 north through Honesdale. You’ll be traveling north on Church Street. Central Park will be on your right, between 9th Street and 10th Street. Follow Rt. 191 north into Honesdale. Turn left onto Church Street, just before the bridge. You’ll be traveling north on Church Street. Central Park will be on your right, between 9th Street and 10th Street. Follow Rt. 652 west to the end and turn right onto US RT 6 west toward Honesdale. A short distance after you pass Dave’s Super Duper, turn right after you cross the bridge, following the signs toward US Rt. 6 west and Rt. 191 north through Honesdale. You’ll be traveling north on Church Street. Central Park will be on your right, between 9th Street and 10th Street. Follow I-84 east to Exit 30 in Pennsylvania at Blooming Grove. Turn Right onto Rt. 402 north and follow it to the end. Turn left onto US RT 6 west toward Honesdale, which you’ll follow for about 15 miles. Just past Dave’s Super Duper, turn right after you cross the bridge, following the signs for US Rt. 6 west and Rt. 191 north through Honesdale. You’ll be traveling north on Church Street. Central Park will be on your right, between 9th Street and 10th Street. Follow US Rt. 6 east right into Honesdale. Turn right onto Main Street by the Hotel Wayne. From Main Street, turn left onto 9th Street, and then another left onto Church Street. Central Park will be to your right. Ask your GPS unit for directions to the intersection of Church Street and 9th Street in Honesdale, PA, or use the street address, which is 901 Church Street, Honesdale, PA. There is no special parking for the concert and downtown activities. There is plenty of on-street parking in Honesdale near the festival site. You may find groups and individuals offering their property for concert parking for a small fee. 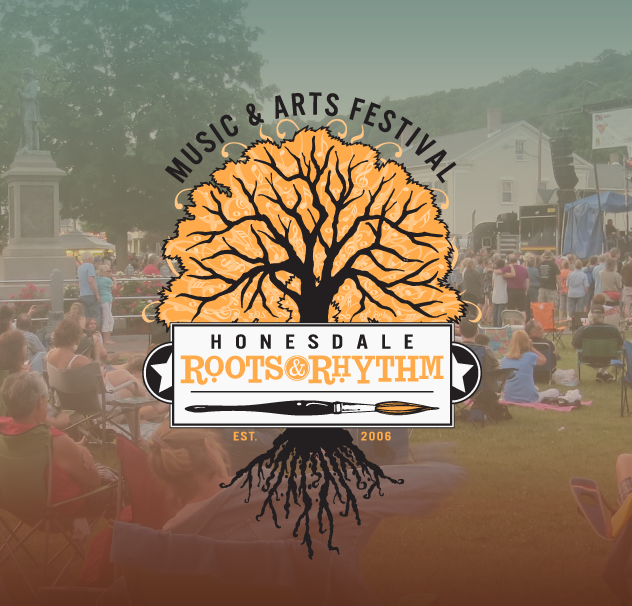 These groups and individuals are not associated with the festival and Honesdale Roots & Rhythm Music and Arts Festival, Inc. will not be responsible for any liabilities in any way, shape, manner or form as a result of your doing business with them.